When I was running my little bag business a couple of years ago (the business was little, not the bags - they were many different sizes), I used to make burlap applique bags lined with plain cotton fabric. Instead of buying this cotton fabric off the bolt, I used to buy cotton saris and cut them up as needed. (A 'sari' is a traditional Indian garment that is a length of cotton/ silk fabric usually 5 or 9 yards long wrapped around the waist with one end over the shoulder.) 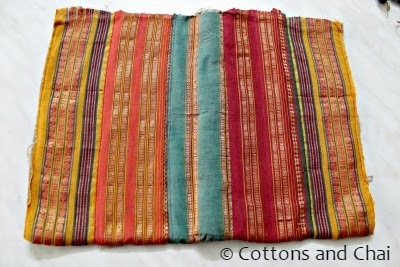 The saris I used were cotton ones with solid colors but they did have a traditional striped contrast brocade border. 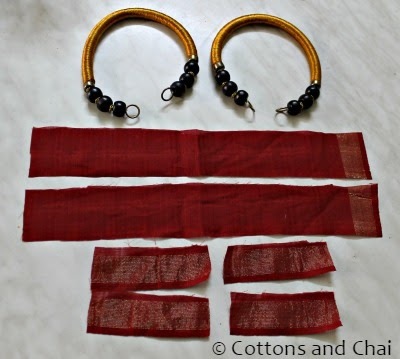 So once I was done with the plain part of the sari, I was left with rolls of these beautiful borders. A few years ago I'd also executed an order for upcycled conference bags made from used sugar or grain sacks. I'd been left with a few pieces of these too. 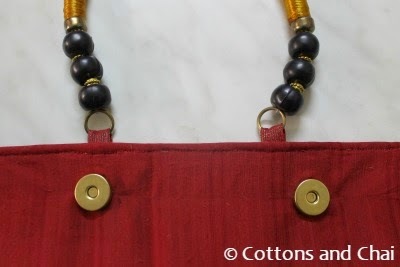 These two types of leftover materials come together to form this brocade border bag! I started by joining up various brocade borders together. 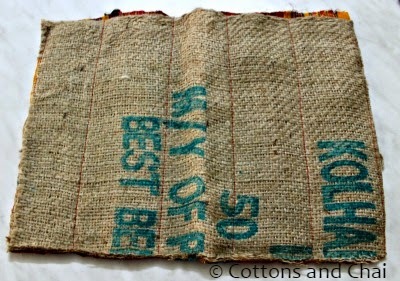 Next I sewed them up on a rectangular piece of sack. This gives the bag structure and stability and is used in lieu of stabilizer/ interfacing. I completed this project on my recent trip back home and got these beautiful handles from a quaint little craft shop in Kolhapur called 'Dreamland'. 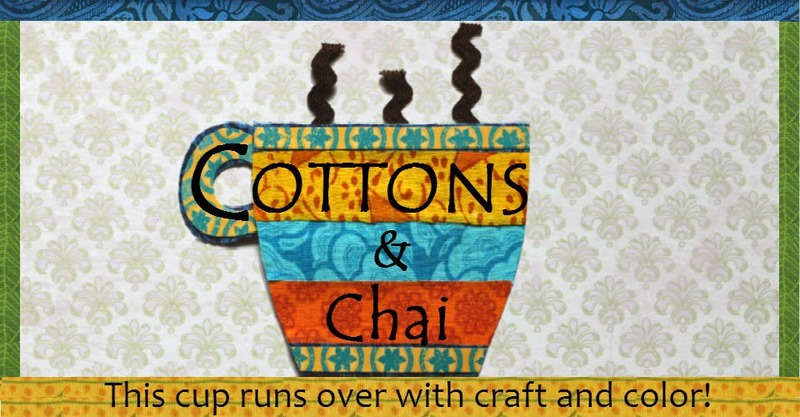 If crafting is your thing, this store certainly lives up to its name! Everything you can possibly dream of is crammed in what seems like less than 200 sq ft of space. Shelves going from top to bottom crammed with yarn, laces, ribbons, buttons and more. 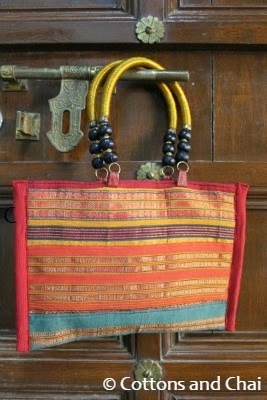 When I asked for bag handles, the 'chacha' (uncle) manning the store behind the counter climbed up on a rather rickety looking stool and from the depths of a top shelf extracted a plastic bag, dusted it off and out tumbled these colorful beaded handles with embroidery thread wound tightly along the handles. I chose this turmeric colored ones with striking black beads that I thought would go nicely with the color scheme of the brocade borders. 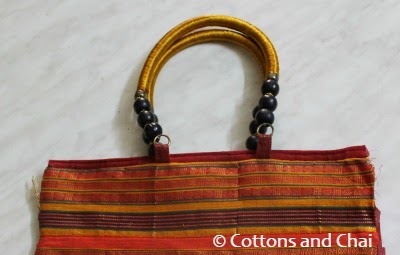 I made little loops of some maroon woven fabric and attached the handles to the top of the bag. 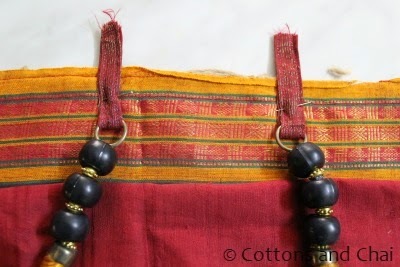 Next I cut a rectangle of the same maroon fabric, sewed it on as lining and edge stitched the top edges of the bag. Then I attached two magnetic snaps as closures and finished binding the sides edges. And here are the brocade borders and gunny sack in their new avatar! That looks so beautiful Kashmira. I admire the clever use of the sugar/grain sacks, they must have added some robust strength beneath the intricate brocade borders. Thanks Priti, Anon. 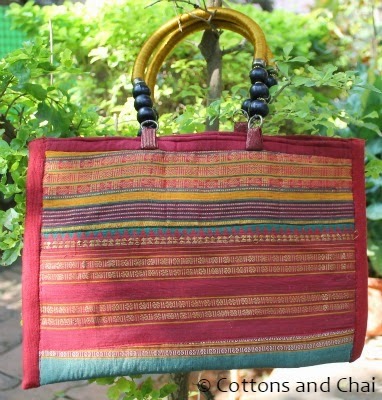 Divya - glad to have you here and hope you enjoyed using those bags!